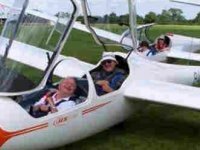 Website and processes: 21 Apr 16 Chris hicks, 4/5 Good "Easy to use sorted in quick time thank you"
If you are thinking about taking up gliding and are looking for a taster flight to see if you really like it - this could be for you. The launch will be by our modern powerful winch, and as the glider levels out at the top of the climb you will hear and feel the instructor releasing the cable, as your flight over the beautiful Essex countryside begins. If time permits,during the flight you will be instructed on the effects of the controls, and should you wish you can take the controls and fly the glider yourself. Upon your return to the airfield, your instructor will fly a circuit around the landing area and increase the airspeed for landing. You will see the landing area approaching ahead and feel a gentle bump as the glider touches down. Although the weather may appear to be good, airfields can be surprisingly cold at times, even in the summer, and especially when a strong wind whistles across the runway. Ladies will feel more comfortable in trousers, especially when getting in and out of the glider. Training available Saturdays, Sundays, most Wednesdays and Fridays, and on Bank Holidays.